Give every day a better beginning -- that’s the simple idea behind Start Happy. Join our movement to take back breakfast and say hello to a happier you! Skip the morning drive-thru cruise of shame. You’re not alone. At one time or another we’ve all settled for the breakfast quickie. While tempting (and understandable … been there, done it), it is completely possible to skip the drive-thru and make something quick and easy at your homebase. 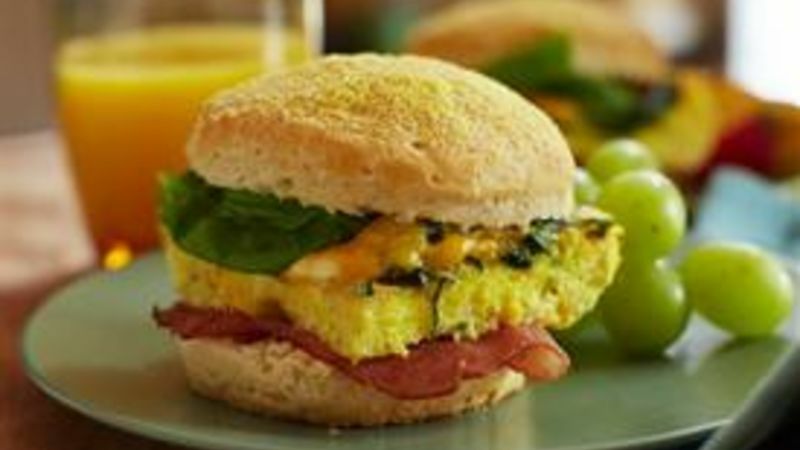 Try this breakfast biscuit with a delicious twist: a slab of cheesy eggs and spinach layered with ham and fresh basil. Super easy to make, too, with the eggs and the biscuits baked all at once. Gather your ingredients. For the cheesy baked eggs you’ll need spinach, olive oil, Cheddar cheese, eggs, milk, salt and pepper. To make the egg sandwiches you’ll need a can of Pillsbury™ Grands!™ buttermilk biscuits, butter, cornmeal, ham and fresh basil. Cook fresh baby spinach in olive oil over medium-high heat until wilted. Spray the bottom only of an 11x7-inch (2-quart) glass baking dish with cooking spray. Layer wilted spinach in bottom of baking dish. Sprinkle shredded Cheddar cheese evenly over spinach. In large bowl, beat eggs, milk, salt and pepper; pour over mixture in baking dish. Cover with foil. Bake in a 350°F oven 40 to 45 minutes or until set and knife inserted in center comes out clean. Meanwhile, open can of biscuits and separate dough into 8 biscuits. Brush tops with melted butter and sprinkle with cornmeal. Bake biscuits on an ungreased cookie sheet during last 15 minutes of egg bake time, or until golden brown. Once the eggs and biscuits are baked, the sandwiches are ready to put together. Split the biscuits and fill them with warm ham, a slab of cheesy eggs and some fresh basil leaves. Then open wide and say "Ahhhh!" Time to serve ‘em up!